Nigerian-American Vigil Chimé, filmmaker, producer and writer, takes full advantage of the networking resources on the Internet. She speaks about her transnational identity and her desire to show realistic images of the African immigrant experience in the United States. Vigil, you came from Nigeria to the United States with your family as a child. Reflecting on the current debates on multiculturalism, hybridity, and transnational identity, as you talk about yourself, also explore how you position yourself in the context of this discourse. In all honesty, I wonder why I still retain a sense of identity to my Nigerian roots. Think about it – I arrived to the US at age 10, going on 11. This is over 30 years ago! I have younger brothers who came at the same time, and today, none of them identifies to Africa as strongly as I do. In fact, for all intents and purposes, my brothers identify themselves as “African-American” more than African. On any given day, people still ask me where I come from. I say Nigeria even though I’ve spent three-quarters of my life in America and only one-quarter in Africa. As I respond to this question, I wonder why. What was it about spending the formative years of my life on African soil that made such an impression on me that I cannot, for the life of me, seem to let it go? It could be that I found the American landscape and culture, upon arrival, stunning and jarring. My experiences as a child growing up in a mostly black and Latino neighborhood in Houston, TX were not positive. My brothers and I were routinely ridiculed for coming from Africa, and chased by black kids who wanted to beat us up after school for the very same reason. I could not understand why our arrival incited such violence in these kids, and so my idea of America was marked as an identity I wanted nothing to do with. No one wanted to beat us up in Nigeria! And given my parents somewhat elite status in Africa, we were prized and never ridiculed. And so I learned to cling to my “Africanness” as something wholly positive and never to be shed. To this day, I subscribe to the same notion – not only in the way I carry myself, but in my work as well. What was your experience with cinema when growing up and how did you become interested in filmmaking? My experience with cinema as a child was nothing out of the ordinary. I was mostly glued to the TV as something to do after homework was completed. Jaunts to the movies were rare, but my brothers and I occasionally went. In fact, I had no more sense I would become a filmmaker as I would become a nurse. These ideas never entered my head as a child. What I did spend my time doing was reading literature. I spent all my allowance buying books and was a regular staple at the local library checking out books, which I then spent much of my free time consuming. In this way, childhood passed in relative peace and harmony. The idea of cinema as a profession came around when I got to college, the University of Houston. There, a dear friend and classmate by the name of David Rogers, first mentioned going further in school to study film at USC. We were at our final year at undergrad, where I had majored in Writing. I wanted to go further to graduate school and study, I don’t know what, perhaps Literature and become an English Professor. Or maybe Law School as my mother wanted though I really had no interest in Law. Maybe be a doctor? These are all proven and expected paths of the African child who is good in school. My love of literature, however, pretty much assured I would not find happiness down these roads – although the English Professor route was more appealing than the others. In any case, Rogers said to me that he was going to California to study film. I said, film? I had no idea people “studied” it. The idea intrigued me a great deal. I was also going to New York City after undergrad, a city I had fallen in love with my last year in high school after attending my uncle’s wedding. I rushed back to Houston, intent on finishing college immediately then relocating to New York City. Rogers knew of these plans and mentioned that New York City is home to two of the greatest film schools in the country, Columbia University and NYU. I became even more intrigued by the idea of film because the notion seemed novel to me. It would combine my love of stories and be something entirely different. After school ended on a Tuesday, I boarded a plane on Thursday and got to NYC – this was in 1990. I took the year off to think what to do. My spirit returned again and again to the idea of studying film in NYC, so I applied to both NYU and Columbia’s graduate film programs, and ended up being accepted in both schools. I chose Columbia for the simple reason the campus had a lawn, whereas NYU did not. One can say that after growing up with space in Texas, I sort of craved grass anywhere I could find it in NYC. Your first films, African Dilemma, African Youth and Manchester Bound, focus on the daily experiences of the African immigrant. As you talk about the films, discuss how you came up with the story, the intended audience and their reception. Since I was unable to run out after graduate school to make a big budget film, I wondered how I was going to make films at all. The idea of low-budget films was borne out of having nothing. 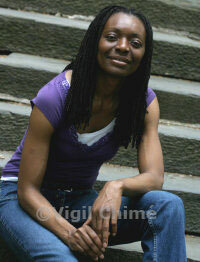 I simply bought a camera and started shooting the African immigrant in New York City. They were all around me here and it seemed no one was pointing a camera at them. I found them touching and, of course, I could identify with them since I am African. I was also tired of the negative portrayal of the African on general American mainstream media. You could say I wanted to add a balanced view of this discourse from one who loved and understood them to pieces. The idea for the three films came about quite naturally from those early years after school. There are about a million stories of the African immigrant experience in America, so the stories were not that difficult to come up with. The intended audience is both the American and the African, particularly the African living still in Africa. Both of these communities – the American and the African living in Africa – have a stilted view of what on earth the African is doing in America – this is to say, what the struggles really are. For the American, I am simply trying to blow down the stereotypes of how he views the African. I am trying to say that on a humanistic level, similarities abound. The African immigrant wants what everyone wants – security and the opportunity for his children to have a better future. For the African living in Africa – what I’m trying to show is the awesome difficulties and hardships that abound in living in America. Your distribution approach entails direct release to DVD. What are the challenges and advantages of this marketing strategy? In the beginning, I thought this is the best way to go. Make a movie, take it around to the African DVD sellers wherever. They would respect the trade in that I am the product maker and they the product seller. I would make a small profit and they will make the same. Not so! I learned that this market is brutal. The African sellers want you to give them the movie at nothing, if you would be so kind. If you give it to them at something, they will buy 10 copies from you and never call you back. Behind your back, copies will be made as you are walking out of the store, and by the time you get to the intersection, someone will be selling the movie back to you! It was incredible, their speed of bootlegging. I could not keep up and quickly made no more movies on that scale to be handed to them. There are no advantages to be gleaned selling directly at straight DVD levels. How would you situate yourself in relationship to Nollywood, have you been influenced by the influx of Nollywood films coming directly from Nigeria that circulate in the United States? And conversely, are your films distributed in Nigeria? What has been the reception? What is your relationship with Nigerian cinema? My people will frown at me for this next statement, but I do no not make Nollywood movies. Not because I’m a snob, it’s just that I was not taught how to make Nollywood movies at Columbia. I have no relationship whatsoever with Nigerian cinema, I don’t even know who the players are. Having said that, I am proud of Nollywood – if for no other reason than showing Americans different views of Africa that they would never get a chance to see if the films were produced by Hollywood. If I can just solve the problem of breaking even after you make a movie, I do not swear off landing in Lagos one day and making a movie with Nollywood celebrities. Your most recent work Honeysuckle is very different both in terms of theme and style. In your discussion about the film, talk about why you chose such a contrasting theme. The film is multi-layered: lesbianism, white woman-black woman in unequal positions as employer-nanny respectively, infidelity—in a most unexpected way. Who did you envision as your audience? The theme of Honeysuckle is not really different from my usual fare. It’s still a story of an American with an African. They only difference, yes, is that the African plays second fiddle to the American. I made this movie to target a particular niche American market – the gay and lesbian market – so felt the lead had to represent a member from that community. As far as style, in wanting to avoid the African DVD seller, I decided to go after the American. Hence, Honeysuckle is my biggest budget film to date. It was made so that I could make other high-budget films if the movie succeeds. At the present time, the movie is still in post-production, so the story as to its success or failure is still a thing of the future. Now, as far as the different layers that you mention – i.e., lesbianism; white woman-black woman in unequal positions, infidelity, well, it’s a Vigil Chimé film and as such, I try my best to take familiar stories and turn them upside down. You are also a writer. In your book, My Songbird Can Dance, you also explored the complicated relationship of a live-in nanny with the family for whom she works. Did this story influence in any way the film Honeysuckle? What inspired you to write the book and how do you work in the two mediums? For the record, the movie came before the book, although the idea for the book came before the movie. Hmm, which came first? The chicken or the egg? I will say it’s a mere coincidence that the two stories deal with the nanny-employer scenarios. I wish they didn’t for it might give the impression I lack imagination. I became a novelist out of frustration, by the way. Since it takes so much effort and time to make a movie, I am restless by nature and find I cannot just sit around working on any one thing for years. It is the easiest thing to write a book, and very rewarding in terms of immediate gratification. A book is done pretty much when you write THE END on the last page. After THE END on a script, the movie-making process has just begun. Then you have to go find the money to make it, then comes production then months and months, if not years, in post. Writing books gives another advantage than making movies. My Songbird Can Dance yielded over 700 pages, giving me the opportunity to say whatever I damned well pleased about this world. Now, if I were to adapt the book for a movie, I would have to cut out much of that in order to fit the entire world into a 90-minute format. Most restrictive. Your film production and distribution company Breakfast Pictures Entertainment, well the name is interesting? What are its mission and goals? The concept of Breakfast Pictures is modeled on the idea of how I feel in general about filmmaking. It takes too long to do anything! Therefore, I wanted a company that completed a movie, particularly the shooting of movies, in the same amount of time it takes you to eat breakfast. Believe it or not – that’s the reason. LOL! Your active Internet involvement and presence, what role has it played in the production, distribution and marketing of your work? My spirit is very independent. I like the idea that I can feed myself through my art. I only require three meals a day and a roof over my head. I figured the Internet would allow me to be independent while feeding me. I could do things my way, tell the kind of stories I want to tell without having to sacrifice my vision for someone else’s. If the Internet model works, it has the potential to accomplish both things for me.